1900 United States. Census Office. 12th census, 1900 population census schedules, Washington, District of Columbia: Bureau of the Census Micro-Film Laboratory, ([197-]) , MAINE > OXFORD > BETHEL, Series: T623 Roll: 596 Page: 37. "Massachusetts Deaths, 1841-1915," database with images, FamilySearch (https://familysearch.org/ark:/61903/1:1:N43J-H4P : 10 December 2014), Edwin C Farwell, 07 Aug 1910; citing Reading,,Massachusetts, 163, State Archives, Boston; FHL microfilm 2,314,919. Emily R. Farwell was born in 1845 or 1846 in Maine. "Maine, Faylene Hutton Cemetery Collection, ca. 1780-1990," database with images, FamilySearch (https://familysearch.org/ark:/61903/1:1:QKMB-B216 : 16 April 2015), John Estes Farwell, 1892; citing Burial, Bethel, Oxford, Maine, United States, Maine State Library, Augusta; FHL microfilm 1,769,530. James Farwell was born on June 20, 1807 in Fitchburg, Worcester County, Massachusetts. He was the son of Abraham Moses Farwell and Lydia Jackson. James died on September 5, 1884 at age 77. He was buried in Phillips Creek Cemetery. John married Betsy Howe, daughter of Moses Howe and Esther Hale, on May 12, 1838 in Waterford, Oxford County, Maine. "Maine Vital Records, 1670-1907 ", database with images, FamilySearch (https://familysearch.org/ark:/61903/1:1:VZ3Q-3FH : 27 December 2014), John E Farwell, 1892. 1880 United States. Census Office. 10th census, 1880 federal population census, Washington, District of Columbia: National Archives and Records Service, ([19--]) , Census Place: Bethel, Oxford, Maine; Roll: 484; Family History Film: 1254484; Page: 40B; Enumeration District: 117; Image: 0205. Walter A. Davis, The Old Records of the Town of Fitchburg, Massachusetts: Feb. 9, 1789-Apr. 18, 1796, Vol. 2, , at https://books.google.com/books?id=mXENAQAAIAAJ . Fitchburg: Sentinel Printing Company, (1899) , p. 334. Lydia Farwell was born in 1813 in Fitchburg, Worcester County, Massachusetts. She was the daughter of Abraham Moses Farwell and Lydia Jackson. Mary Ann Farwell was born in 1815 in Fitchburg, Worcester County, Massachusetts. Mersilva F. Farwell was born about December, 1849 in Maine. Molly Farwell of Groton was born perhaps about 1752. Thomas W. Baldwin, Vital records of Harvard, Massachusetts to the year 1850, Boston: Wright & Potter, (1917) , Vol. 1, p. 171. Sarah Farwell was born in 1802 in Fitchburg, Worcester County, Massachusetts. Sarah died on June 10, 1853 in Hinsdale, Cattaraugus County, New York. She was buried in Hinsdale Cemetery, Hinsdale, Cattaraugus County, New York. Susan Farwell was born on April 22, 1809 in Fitchburg, Worcester County, Massachusetts. Susan died on April 7, 1884 in Ischua, Cattaraugus County, New York, at age 74. She was buried in Hinsdale Cemetery, Maplehurst, Cattaraugus County, New York. Thaddeus Farwell was born on March 17, 1803 in Fitchburg, Worcester County, Massachusetts. Thaddeus died on October 7, 1882 in Cattaraugus County, New York, at age 79. He was buried in Hinsdale Cemetery, Maplehurst, Cattaraugus County, New York. "Maine Vital Records, 1670-1907 ", database with images, FamilySearch (https://familysearch.org/ark:/61903/1:1:2HJP-PDB : 27 December 2014), Levi B Pollard in entry for Winona Pollard, 1882. 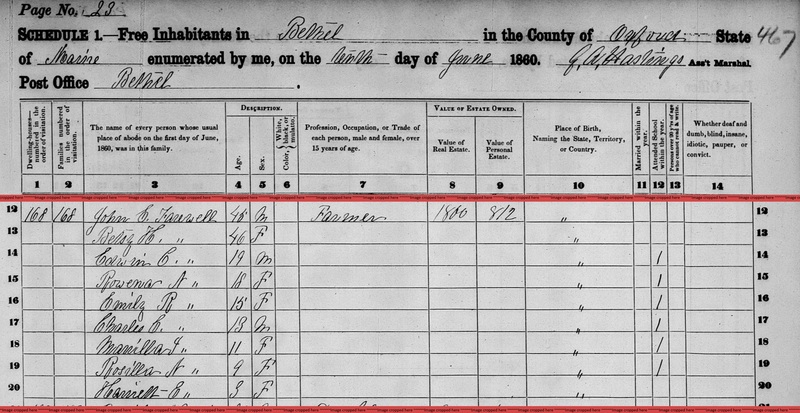 "United States Census, 1900," database with images, FamilySearch (https://familysearch.org/ark:/61903/1:1:MML8-MJB : 20 January 2015), Exie Bryson in household of Elmer G Bryson, Glenwood Plantation, Haynesville town & T.2-3-R.2-4, Aroostook, Maine, United States; citing sheet 3A, family 37, NARA microfilm publication T623 (Washington, D.C.: National Archives and Records Administration, n.d.); FHL microfilm 1,240,589. 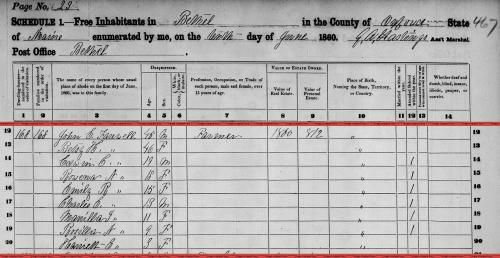 "United States Census, 1880," database with images, FamilySearch (https://familysearch.org/ark:/61903/1:1:MF3N-P4S : 24 December 2015), Levi B Pollard, Haynesville, Aroostook, Maine, United States; citing enumeration district ED 216, sheet 380D, NARA microfilm publication T9 (Washington D.C.: National Archives and Records Administration, n.d.), roll 0477; FHL microfilm 1,254,477.